We started off by reading through the “Little Letter X Book” from The Measured Mom. This helped introduce the various X-related items we discussed during this lesson. Then we moved on to a few pages from This Reading Mama’s letter X preschool pack and this letter X worksheet from Education.com. We followed that by painting the xylophone color by number page from Teaching Mama with watercolors. We ended the day with something fun…building a life-sized skeleton! I printed out the child-size skeleton from Eskeletons. 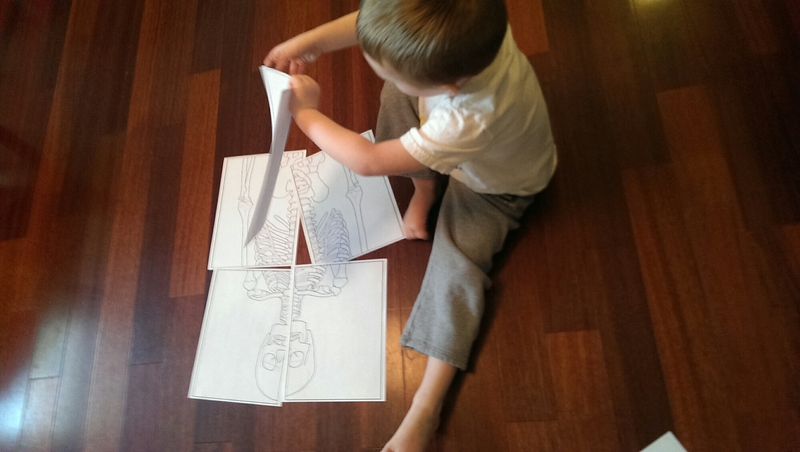 It prints on several sheets, which can then be laid on the floor together to form an “x-ray.” We then talked about the different bones, and I had him point to the parts of his body that I was pointing on the skeleton. He was so excited about this that he had to lay it out for his dad again when he got home from work!